RMI partners with several organizations that provides pre-packaged food for its Hope for Kidz Hot Lunch and Food for Health food aid programs. 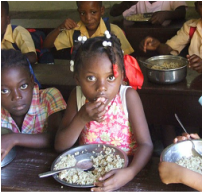 These nutritious meals are scientifically created to help those suffering food deprivation and severe malnutrition. 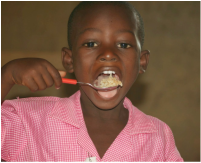 The meals are able to transform the health, growth and physical well-being of children as well as adults. They are also rice based which is already a key component of the Haitian diet. ​What it does: metabolizes protein and fat; helps in the formation of antibodies to fight infection and the formation of red blood cells. Deficiencies result in: anemia, smooth tongue, fatigue, and nerve degeneration that can lead to paralysis. ​What it does: source of energy and stores energy; forms the major component of cell walls; nourishes skin and hair; insulates the body from heat and cold; and cushions the main organs of the body. Deficiencies result in: weakness, rough skin, brittle hair and intolerance to heat and cold. What it does: helps with iron absorption and is part of several enzymes. Deficiencies result in: anemia and bone changes. ​What it does: growth and repair of the body; helps transport nutrients throughout the body; helps body fight infection, regulates fluid in the body; is a source of protein. What it does: helps in vision, growth and repair of the body; improves immunity; and helps decrease the risk of cancer. Deficiencies result in: night blindness, rough skin, increased risk of infection, impaired bone and body growth, abnormal tooth and jaw alignment, eye problems that can lead to blindness. What it does: helps in bone formation, protein use by the body, enzyme action, muscle activity, and nerve function. Deficiencies result in: weakness, confusion, decreased function of the pancreas, growth failure, and muscle spasms. What it does: helps in the release of energy from food; promotes healthy skin, nerves, and the digestive system. Deficiencies result in: nervous disorders, skin rashes, muscle weakness, anemia, seizures, and kidney stones. ​What it does: helps in wound healing; maintains bones and teeth; strengthens blood vessels; improves immunity and helps the body absorb iron. Deficiencies result in: scurvy, bleeding gums, tooth loss, and even death; anemia, arteriosclerosis (clogged blood vessels), depression, increased infections, muscle degeneration, rough skin, weakened bones, and poor wound healing. What it does: is part of many proteins and present in the hormone insulin; helps in the production of proteins, boosts immunity; helps transport Vitamin A in the body; helps in wound healing, taste and normal fetal development. Deficiencies result in: poor wound healing. What it does: helps in the formation of hemoglobin (enables red blood cells to carry oxygen) and helps the body use energy from food. Deficiencies result in: anemia, weakness, increased risk of infections, and inability to concentrate. ​What it does: provides the body with energy to perform all its functions; preferred source of energy for the brain and nervous system. Deficiencies result in: weakness, fatigue, confusion, low blood sugar (hypoglycemia). ​What it does: helps in energy metabolism, fat production, and storage of a form of sugar (glycogen) that is stored in the liver. Deficiencies result in: loss of appetite, nausea, depression, muscle pain, weakness, fatigue, and skin rash. What it does: bone and tooth formation; helps body absorb and use calcium and phosphorous that aids in bone formation. Deficiencies result in: soft bones, abnormal growth, joint pain, and poorly formed teeth. What it does: maintains nerve cells; helps in red blood cell production; and helps in the production of genetic material. Deficiencies result in: skin rash on the body where exposed to the sun, loss of appetite, dizziness, weakness, irritability, fatigue, confusion, and indigestion. What it does: strengthens bones and teeth; helps muscles work; and helps blood clot, nerves to function and blood pressure function. Deficiencies result in: stunted growth, tooth decay and bone loss in adults.